Charities based across Staffordshire are to benefit from fundraising efforts by Stone based Woolcool. 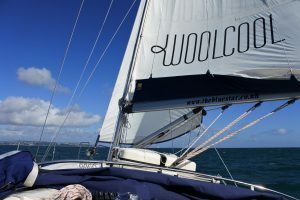 The growing wool packaging company sponsored local sailor Mike Goodwin as he navigated around the British coastline to raise funds for the Cystic Fibrosis Trust. Strategic Director Keith Spilsbury was part of the crew for the penultimate leg of the sailing marathon and has pledged to continue the fundraising drive. 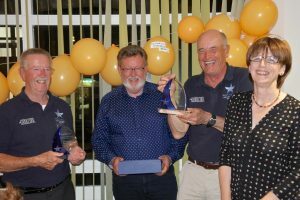 “Mike and his team were amazing and raised around £25,000 for Cystic Fibrosis research, by the time they sailed into Hythe, they had completed over 2,400 miles around the coast of the UK” said Keith. “Now we want to support other Staffordshire charities as part of our commitment to the county.” Mike, aged 60, was accompanied on the voyage by Roger Colner, from Lymington, Hampshire, and they were joined by crew mates on the various legs of the round Britain sail who each helped to raise funds for the charity. Keith said that Woolcool were already planning to work with Stone Radio, a new community radio project to be based at the town’s railway station. Staff at the Walton Industrial Estate based company also plan to talk to other charities including the Donna Louise Trust, the Gingerbread Centre and SHINE to see how best they can help. Added Keith: “We had family ties to the round Britain sail as Mike Goodwin is a cousin of Woolcool founder Angela Morris, my wife. “We know Mike’s son, Daniel, and have seen how Cystic Fibrosis has impacted on his life. Mike’s other son, Cliff, is involved in Stone Radio and we want to help them too. Woolcool has developed a unique wool packaging system which keeps perishable products cool for longer than the commonly used polystyrene or bubble wrap. The Woolcool system keeps perishable goods including food and vaccines at an optimum temperature during the delivery cycle.